Very few video games understand pacing as well as The Legend of Zelda: Ocarina of Time. Even titles that share the The Legend of Zelda moniker struggle to replicate the balance that Ocarina of Time so masterfully pulled off. When it comes down to it, pacing is a balancing act, doubly so for video games. A game must not only balance gameplay but ensure that any narrative moves organically alongside it, pacing progression just enough where audiences are advancing neither too fast or too slow. A well-paced game ideally has no fluff, with every facet of its design acting as an essential piece of the title’s inherent structure. The Legend of Zelda: Ocarina of Time is a game lacking in the superfluous. Every narrative or gameplay beat exists in explicit benefit to the experience. Hyrule is small, but it is dense with secrets to find and connections to each of the game’s main areas; dungeons typically take upwards to one hour to complete, ensuring each setting is fully utilized without outstaying their welcome; and the story structure maintains that there is a sense of urgency to Link’s quest without raising the stakes to the point where focusing on side quests comes off tonally inappropriate. Ocarina of Time has a clear, defined structure that thrives on balance. The game’s very opening puts said balance front and center. Ocarina of Time’s first hour is split into two halves: before the Great Deku Tree and Inside the Great Deku Tree. The former sees Link acquiring his sword and shield whereas the latter marks the title’s first dungeon. On a surface level, it seems as if the balancing act is quite clear- the first half hour takes place outside the dungeon while the second takes place inside, but the balance is actually far more nuanced. Pacing in a video game is more than just splitting segments into digestible chunks. Rather, it relies on ensuring that players are given a considerable amount of freedom in each section of the game. Although Link is tasked with finding the Kokiri Sword and Deku Shield as soon as possible to meet with the Great Deku Tree, players are likewise encouraged to explore Kokiri Forest to their heart’s content. The adventure’s inherent pacing remains intact regardless of how each individual player approaches the task at hand. Should one decide to take their time speaking with their fellow Kokiri, they will be given a better sense of the world Link grew up in. Audiences will learn through explicit dialogue that the Kokiri do not grow up, that Link has been othered by his peers due to the lack of a fairy, and how to maneuver Link in Ocarina of Time’s 3D space. At the same time, heading straight for the sword and shield place Link in enough gameplay scenarios where audiences can learn by doing while also inferring narrative elements through visuals- all the Kokiri are children and Link’s fairy is of a different color than that of his peers. It ultimately does not matter which approach a player chooses as both methods are simply two halves of the same whole. Ocarina of Time respects its audience enough to trust that they do not need to be explicitly guided towards the sword and shield. 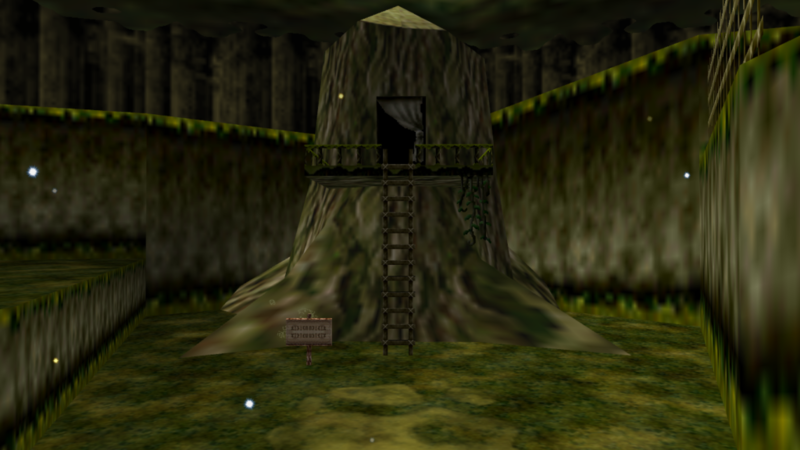 More importantly, Ocarina of Time respects its design enough to trust that Kokiri Forest can and will convey all the information it needs to either visually or through text. This is a design philosophy that carries over not only Inside the Great Deku Tree but the rest of the game as well. Good pacing is simply not possible without good game design. Both infer one another and dictate progression. This concept is seen all the clearer once Link pulls the Master Sword from its pedestal and becomes an adult. As soon as Sheik tasks Link with finding the Hookshot so that he may enter the Forest Temple, players are given freedom to explore the changed Hyrule. Although the story does dictate Link complete the Forest Temple sooner rather than later, the context of his quest actually encourages exploration. As soon as Link finds the Hookshot in Kakariko Village, players can: find ten Heart Pieces, gain access to Epona, do the Biggoron Sword side quest, and complete the non-dungeon quests associated with the Fire and Water Temples. Although the narrative is very much focused on Link returning to his home village to tackle the Forest Temple, Ocarina of Time does not bar players from straying off the beaten path as it does not need to. The urgency of Link’s quest is not clearing the Forest Temple, it is saving Hyrule. 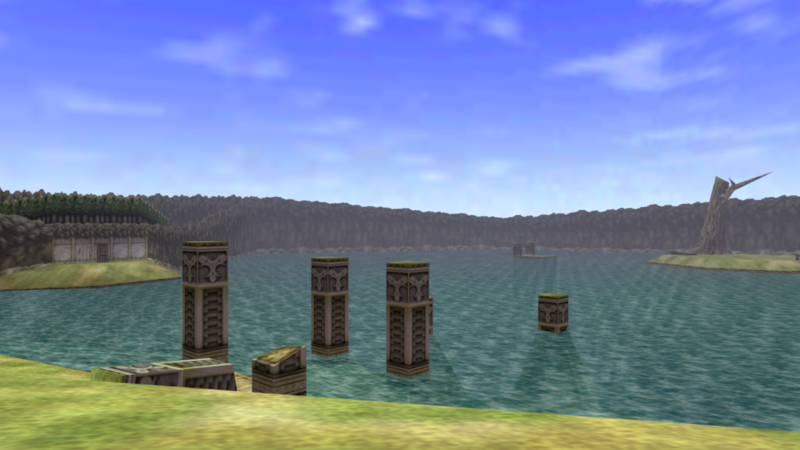 Every perceived side action in Ocarina of Time contributes in some way to the game’s natural progression and the story’s advancement. Heart Pieces are optional, but they serve the purpose of increasing Link’s health, ensuring he can survive more challenging scenarios; Epona allows Link to travel Hyrule faster than on foot while also giving him convenient access to Gerudo Valley; the Biggoron Sword is totally unnecessary for beating the game, but it gives Link an even stronger weapon to use on his journey; and both the Fire and Water Temple quests must be completed to finish the game. Should a player stall for as long as possible before tackling a single Temple, they will have naturally completed a fair chunk of the Adult portion of the game at no detriment to Ocarina of Time’s pacing or story. Freedom is just as important as structure, and Ocarina of Time creates freedom in its structure. The story never loses focus, because what Link can accomplish away from the “main plot” is actually narratively relevant in his quest to save Hyrule. Perhaps most importantly, a well-paced game understands the need for levity. The Legend of Zelda: Ocarina of Time may not tell a particularly deep story, but is nonetheless one centered around heavy subject matter. Ganondorf actively attempts to genocide both the Goron and the Zora. Hyrule Market is overrun with ReDeads. When Link returns to his home village, Kokiri Village is in shambles with the children of the forest forced to hide in their homes. Nintendo understands that it must present its story with the right amount of drama, and it does so appropriately, but it likewise remembers that Ocarina of Time is first and foremost a video game. Sometimes, an audience needs a break from the drama to take in the story and reflect on what has happened. Fishing, heart piece hunting, and mini-games all allow players a moment to breathe without ever halting progression. Levity is narratively important, but video games can make greater use of smaller moments by tying important gameplay beats to them. 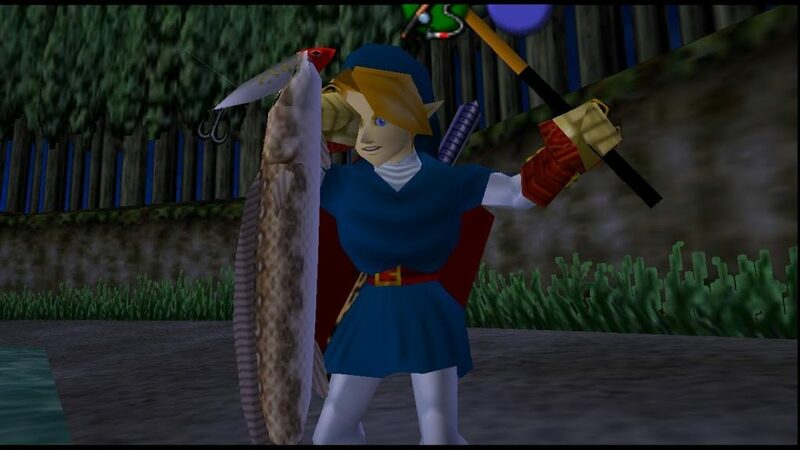 Link being able to fish has no weight in the context of the story, but it may have weight in the context of the player. Ocarina of Time’s game design is strong enough where someone can play from start to finish just doing mandatory content and come away satisfied, but the adventure is structured well enough where the divide between what is optional and what is mandatory is often left unclear. Which, more often than not, is how it should be for a video game. All content present must have some semblance of meaning – of importance – which is ultimately the case for Ocarina. The balance in pacing Ocarina of Time strikes is just as much a literal structural one as it is conceptual understanding of the medium. A video game cannot be paced like a movie or a book. Video games use interactivity on a level that other mediums cannot. As a result, pacing must take advantage of what is capable only in a video game: freedom. At the same time, freedom without focus can cannibalize a product, making it come off “purposeless.” Ocarina of Time has a clear purpose in the story it tells, in where gameplay is sectioned, and the balanced struck between what must be done and what can be done. The Legend of Zelda: Ocarina of Time tells a narratively and thematically simple enough story suited for any medium, but video game stories are more than their script. A game’s story is told through gameplay. Just as much as a plot must be paced, so must the act of interactivity. Ocarina of Time does not bog the player down with cutscenes, it does not force Link to walk a path against his will, and it does not lock away content behind anything but what Link is capable of at any given moment. The Legend of Zelda: Ocarina of Time respects its audience’s time, trusts its inherent design, and understands what can only be done in the video game medium. When all is said and done, games need not more to be well paced.